Along with Dobzhansky (1900 - 1975), animal systematist Ernst Mayr, and paleontologist George Gaylord Simpson (1902 - 1984), Stebbins (Jan. 6, 1906 - Jan. 19 2000) is considered one of the architects of the modern evolutionary synthesis of the 1930s and 1940s, an intellectual watershed and historic turning point that brought together research in cytology, genetics, systematics, paleontology into a common evolutionary framework. This synthesis, which had the effect of reconciling the often opposing views of laboratory-oriented geneticists and natural history oriented systematists, made Charles Darwin's theory of evolution by natural selection the centerpiece of the new discipline of evolutionary biology. 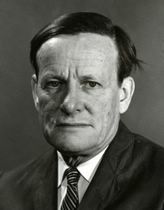 In this role, Stebbins is credited with bringing a modern framework to the study of plant evolution, and he is perhaps best known for his book Variation and Evolution in Plants, published by Columbia University Press (NY) in 1950. In the 1940s, Stebbins also played an important role in organizing the nascent Society for the Study of Evolution, of which he became the third president in 1948, and used his position to speak out for the botanical side of evolutionary studies, a field that had been dominated by zoologists. Photo .